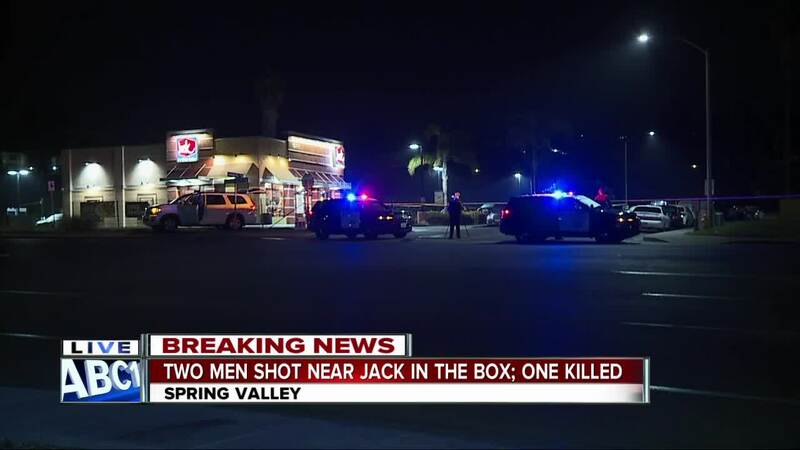 SPRING VALLEY, Calif. (KGTV) - A man died and another remains hospitalized Thursday after both were shot at a Spring Valley Jack in the Box restaurant. Just before 12 a.m., sheriff’s deputies received reports of gunfire at the Jack in the Box in the 10000 block of Campo Road. Shortly after the reports, a black BMW arrived at Sharp Grossmont Hospital and dropped off two men in their early 30s who had gunshot wounds. One of the men died from his injuries, 10News learned. The other man is expected to survive, deputies said Thursday afternoon. Deputies are investigating the circumstances that led to the shooting, and as of 8:30 a.m., a description of the suspected shooter was not available. The area of Campo Road near Sweetwater Springs Boulevard was expected to be shut down due to the investigation.